Lance Armstrong's attorney sent a letter to the federal prosecutor investigating the seven-time Tour de France winner and his associates for possible fraud and doping violations, complaining about leaks to the media. Monday's letter from Tim Herman to Assistant U.S. Attorney Douglas Miller in Los Angeles says it's "especially unfair to subject Mr. Armstrong to this continuing media blitz when he is in the middle of his final Tour de France." A copy of the letter was obtained by The Associated Press. The letter also said Armstrong's attorneys talked to Miller about the leaks less than two weeks ago and are "extremely frustrated that these leaks have intensified." An e-mail message left for Miller was not immediately returned Monday. Armstrong has denied allegations of doping. The investigation was spurred by accusations from Floyd Landis, one of Armstrong's former teammates on the US Postal team, in a series of e-mails sent to cycling and doping officials this spring. 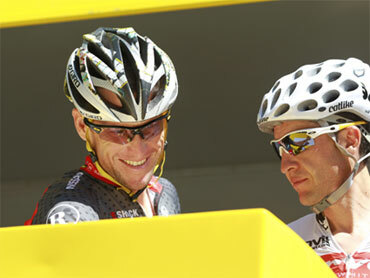 Landis, who was stripped of his 2006 Tour title for doping, said the use of banned substances was common on the team. Armstrong has denied those allegations and has questioned Landis' credibility. The New York Times reported that authorities have issued grand jury subpoenas. According to the New York Daily News, one of those went to American cyclist Greg LeMond, a three-time Tour winner who has feuded with Armstrong for several years. "This appears to be a full-blown and largely unmonitored exploration of Floyd Landis' patently unreliable and routinely changing accusations of possible improper conduct in the professional cycling industry at large," Herman wrote. "In fact, the 'investigation' has recently erupted into a forum for disgruntled Lance haters to bash Armstrong and try to settle old scores." The letter notes that after seeing some of the leaks in the media, Herman requested a meeting with Miller but that the prosecutor refused to discuss investigation theories or general topics. "It is egregiously unfair and frustrating for New York reporters to have far more knowledge about this matter than Mr. Armstrong or his attorney," Herman wrote. Armstrong was in 31st place Monday in what he has said will be his last Tour de France, 40 minutes, 31 seconds behind leader Alberto Contador of Spain.